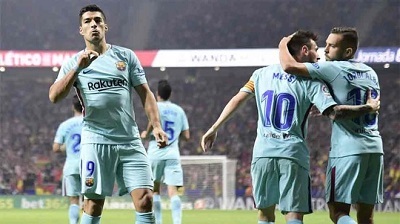 FC Barcelona battled Atlético to a 1-1 draw after Luis Suarez scored a late equalizer for the Blaugrana to maintain their unbeaten run in La Liga. Saul Niguez gave the home side the lead in the 20th minute, in the 81st minute, substitute Sergi Roberto delivered a fine cross towards the far post for Suarez to head the equalizer. This result ensured Barça would leave the Spanish capital unbeaten and remain six points ahead of Atlético and five clear of second-placed Real Madrid. Also, Barcelona’s run of consecutive league wins ends at 14, which was 2 shy of the league record. Barça will now shift their attention to European competition when they host Olympiakos in their third Champions League’s group stage match on Wednesday. Goals: 1-0, Saúl (min. 21); 1-1, Luis Suárez (min. 81). Cautions: Gabi, Saúl & Griezmann; Busquets & Rakitic. Previous PostBarça remain perfect after 3-0 victory against Las Palmas in an empty Camp Nou. Next PostBarça defeats Olympiakos 3-1 as Messi nets 100th European Goal.